With its striking green dome and colonnaded façade looming over the riverside, Brisbane’s grand Customs House stands out as one of the city’s most iconic heritage buildings. Dating back to 1889, the Customs House originally served to collect the custom duties on imports brought in Brisbane port, but today, the historic building is run by The University of Queensland and best known for its glamorous ballroom and function rooms. The architectural gem is also open to the public, with visitors able to stroll around the building, view the Stuartholme-Behan exhibition of Australian Art and admire the collection of artifacts and memorabilia on display. There’s also an on-site restaurant, with terrace seating overlooking the Brisbane River and the Story Bridge. 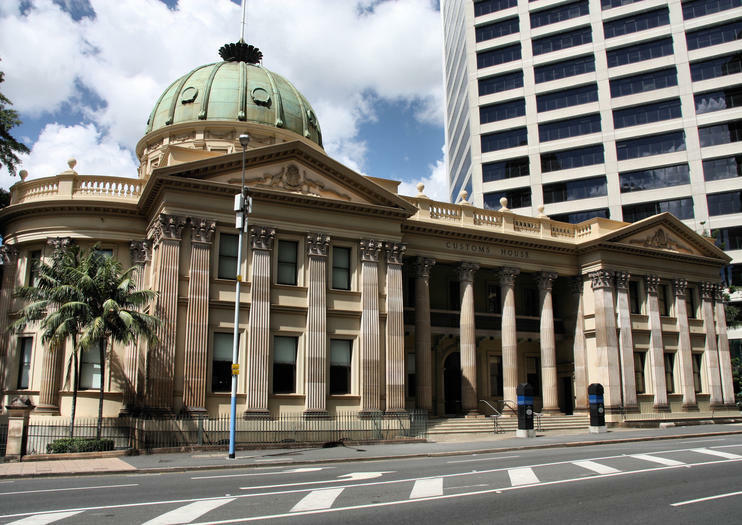 The Customs House is located on Queen Street in central Brisbane and is open daily from 9am to late. Discover the rich history and creative heart of Brisbane on this full-day tour from the Gold Coast, including hotel pick-up. Admire architectural gems like Parliament House and Newstead House; stroll around the South Bank Parklands; and take a scenic 45-minute boat cruise down the Brisbane River. After an indulgent morning tea break, soar high over the city as you ride the Wheel of Brisbane, then spend the afternoon exploring independently.